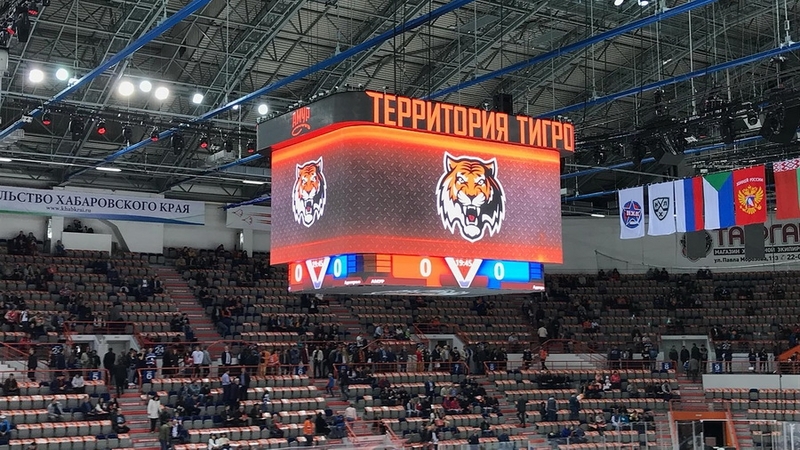 Platinum Arena, located at the very far-east Russian city of Khabarovsk, has chosen Colosseo as a proven and reliable technology provider for KHL arenas, to install its complete turnkey solution including an LED video cube and ColosseoSMP (game presentation system) to enhance the game day experience to the best possible level. The installed Colosseo LED VISION HD center-hung video board eye-catching rectangular design provides over 110 sqm of seamless, zero-gap LED canvas in 6 mm LED line spacing for sharp and vivid video, sponsorship, scoring, timekeeping and statistical purposes. Content for the new video cube and another LED scoreboard is created, organized and delivered by the most powerful and industry-leading tool for venue multimedia management, Colosseo Single Media Platform (SMP) solution, which creates instant replays from all available camera angles, provides the best game highlights and entertains fans with attractive, entertaining and engaging animations and graphics while providing seamless ad management. The whole solution comes hand in hand with Colosseo Timekeeping, Scoring and Statistics as the data-flow is fully synchronized and integrated with Colosseo SMP to provide fans with real-time infotainment. Colosseo is proud to equip yet another major KHL venue and demonstrate its leading position within the venue industry. ColosseoEAS, Inc. is the producer of the first completely integrated software platform for digital content creation and distribution for venues. With custom designed LED display systems, timekeeping/scoring systems, mobile applications and interactive IPTV, Colosseo has developed the most complete turnkey solution for sports venues, convention centers, shopping malls and transportation available on the market today. With over 80 installations in North America, Latin America, Europe, Africa and Asia in the past 8 years, Colosseo is taking multimedia management, interactivity, entertainment and infotainment to the next level.